Doreen Rappaport, Candlewick Books. Ages 9-12. 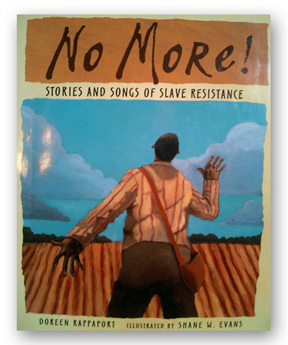 This the first in a series of three powerful books about the African-American experience. No More tells stories that are seldom shared in the more traditional methods of conveying history. The book stays true to the way history was shared by black people in America for years — orally. Pulling together stories in their written form is often a difficult task for chroniclers of black history, but Doreen Rappaport achieves this wonderfully in her collection of amazing stories. For Evans, visualizing these stories was an also a challenge. Together, the books create a spiritual journey into lives that are rich in joy and grief. The series is highly recommended for all ages. No More demonstrates how sharing stories is a critical way to gain insight and understanding about other people.